Our trip began in Alpnachstad where the the valley station of the mountain railway is located. Pilatus Bahn, as the railway is called, came to existence in 1889 and is with the gradient up to 48% the steepest cogwheel railway in the world. After buying our train tickets, we’ve boarded the train and took a lift to the middle station Ämsigen (1359 m). 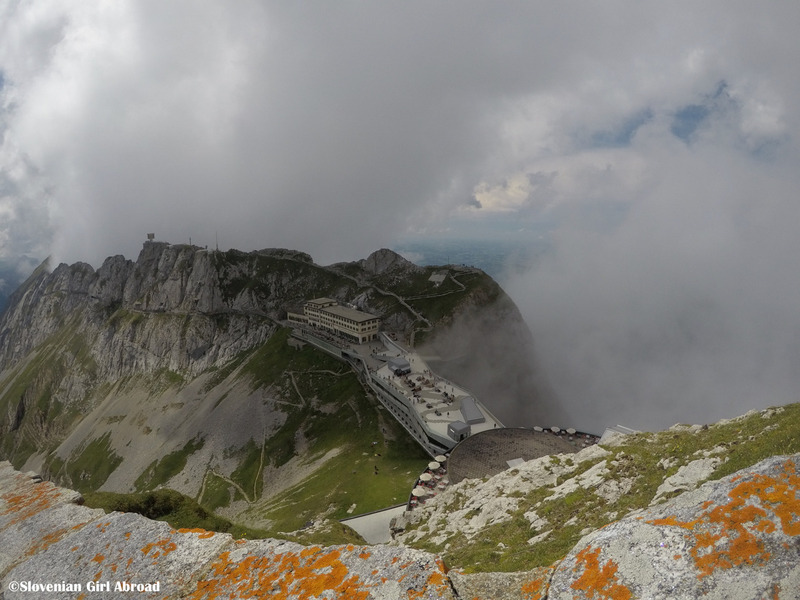 From there we hiked all the way up to top of the Pilatus – Pilatus Kulm (2070 m). 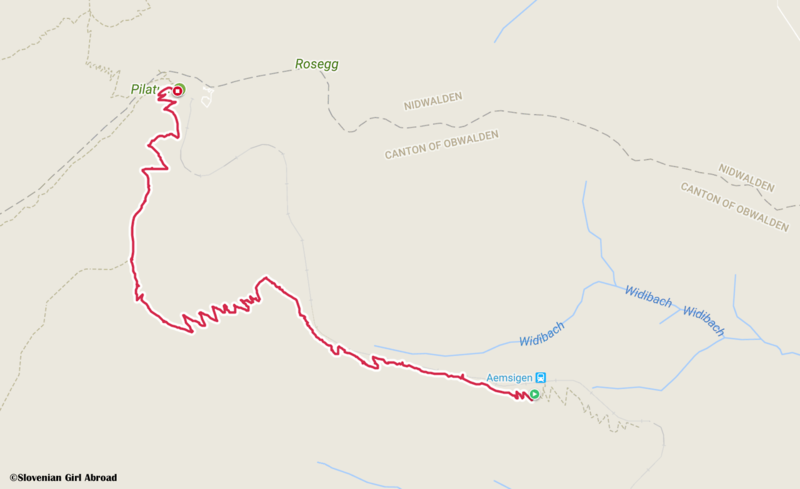 I liked the hiking trail from Ämsigen to Pilatus Kulm a lot. It is app. 3,4 km long and is quite steep at some points. It takes some effort to conquer it, but hiking through gorgeous alpine meadows and striking rock formations with some amazing views over Vierwaldstättersee (Lake Lucerne) made the effort much easier for me. After app. 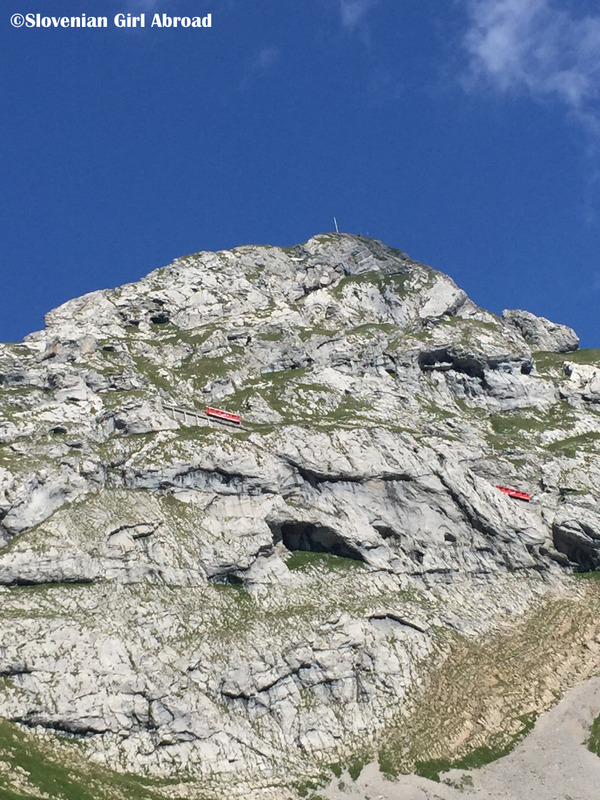 2 hours of hiking, we’ve reached the top of Pilatus – Pilatus Kulm. By the time we got there, the fog and clouds covered covered the mountain and hid the panoramic views over Lucerne and Vierwaldstätterse. 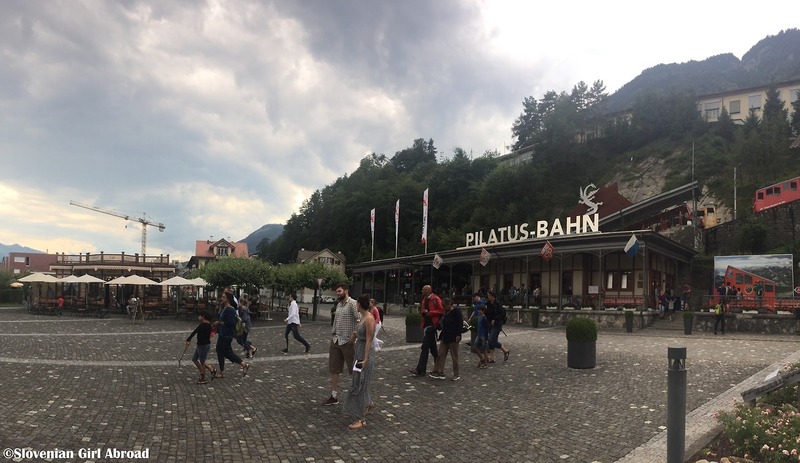 Therefore, instead of walking to the viewing points, we went for a lunch at the restaurant of Hotel Pilatus-Kulm. After lunch, the clouds and fog lifted for a bit. 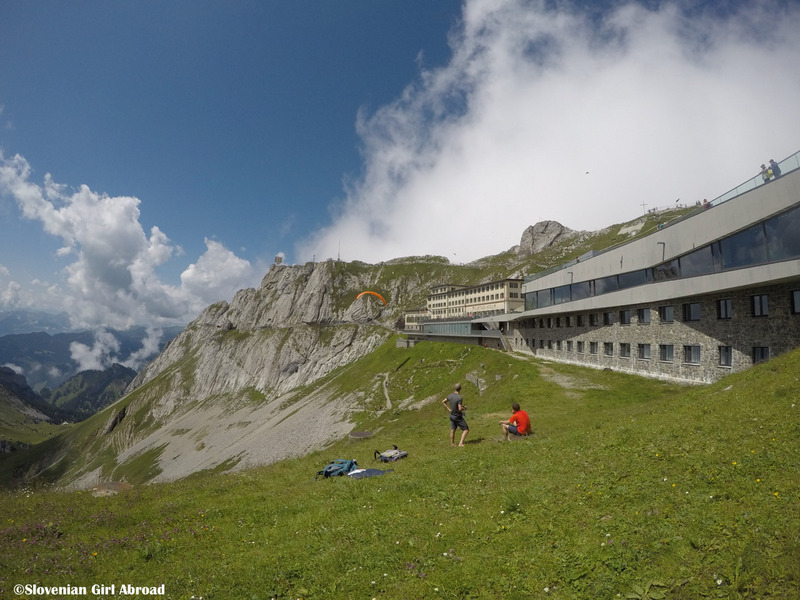 We walked to the Oberhaupt (2106m) and Esel (2118 m) viewing points. Despite the sky wasn’t clear, we were still able to take a glimpse of the amazing panorama over Lucerne and the surrounding area. On our way up to both viewing points, it became clear to us, Pilatus Kulm is very touristy place. Not only, it is gorgeous scenic place, but is also easy accessible from Lucerne by the mountain railway from Alpnachstad we took, and by the aerial cableway and gondola from Kriens. Therefore, it is not surprising to meet the tourists wearing the most inappropriate footwear for the mountains (e.g. heels) trying to walk uphill to the viewing points. Even though the trail to viewing points Oberhaupt and Esel aren’t difficult, the surface of the path is uneven. Watching tourists in inappropriate footwear struggling not to get hurt while super slowly walking those paths was rather painful. After we’ve caught a glimpse of the panoramic views, it was soon time to return back to the valley. We took a train back to Alpnachstad what proved to be a wise decision, because on or ride down it started to drizzle. 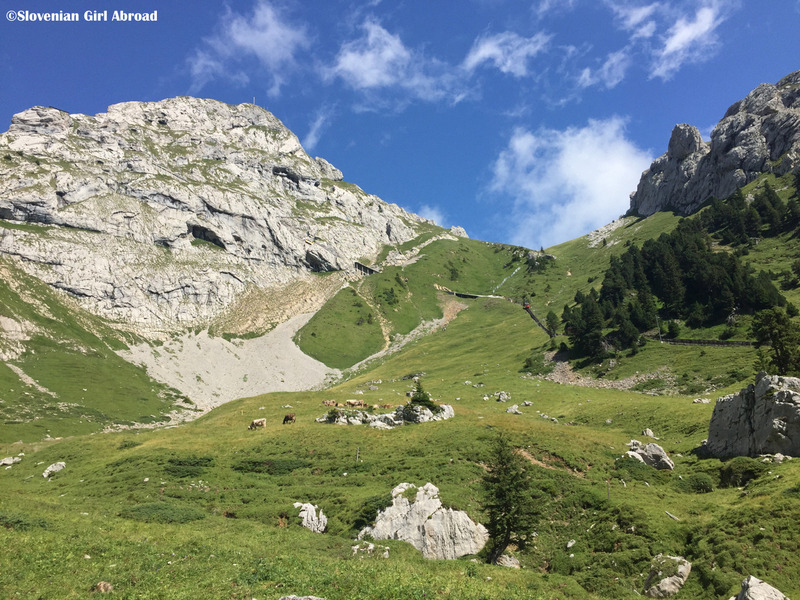 HOW TO GET TO MT PILATUS? From Lucerne main railway station, take the train to Alpnachstad railway station. From Lucerne’s pier take the boat to Alpnachstad. At the highway A8 drive in direction Sarnen/Interlaken, take exit Alpnachstad, then follow the signs to the station of the Pilatus Bahn. Awesome! How did you get he coupons? I admit, I took the lazy way and went all the way up by train 😛 I think it’s actually great how they made the mountain accessible to almost anyone! Thumbs up to the Swiss transportation system 😉 Very nice pics and video, I really loved the views from there too! I did the same mistake once too. I definitely agree with you about the importance of proper research. This is on my list for October so it’s great information for our upcoming trip. Thanks! 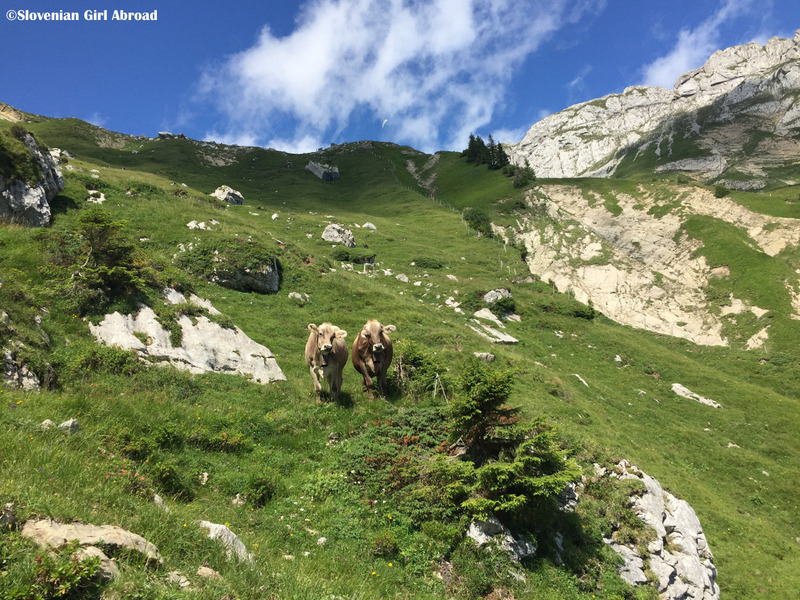 Nice video and great job hiking Pilatus. Pilatus was one of the highlights of my recent trip to Switzerland. Yes, the scenery is most certainly spectacular. 🙂 Where in Switzerland were you? I get to go to Switzerland for work next month and am so bummed that I won’t have time to see the Alps and go for a hike too! These views look amazing and I’d love to visit Lucerne myself! What beautiful sights and photos! I laughed a bit when you mentioned tourists where inappropriate shoes for the hike. I see many tourists going to the mountains in Banff in heels as well! What an amazing hike! Even though the views weren’t always perfectly clearly, I like the shots with the clouds drifting by – so pretty! Looks an amazing hike! 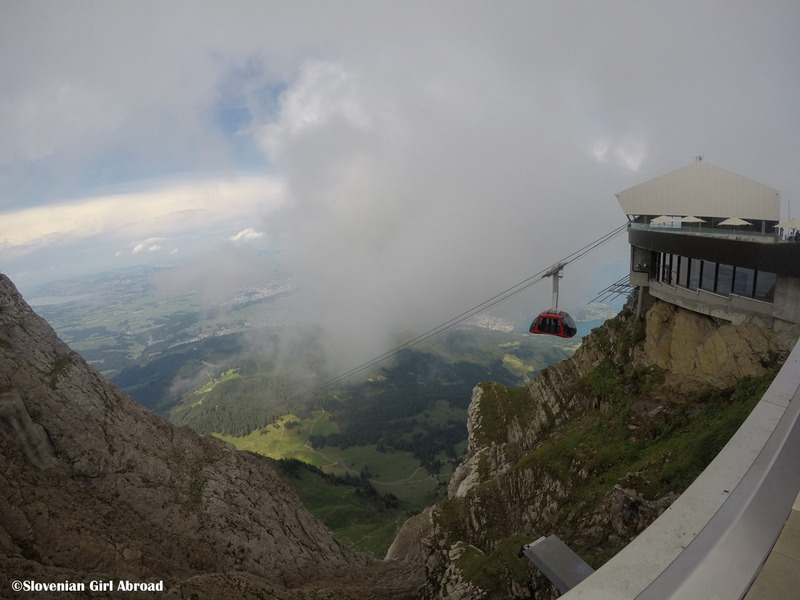 I’ve been up Pilatus once – by the aerial cableway and gondola. Would have loved to do the cogwheel train but it was too early in the season. I was appropriately dressed though with sensible footwear. Who would think of wearing heels to go up a mountain?! Even in April when I was there, the summit still had a lot of snow and there are steep drops too. Even when it’s cloudy the mountains are beautiful! Lucky you! The Swiss Alps are on top of my “to do” list!!! Thank you for your likes on my Thailand posts – Railay Rocks, Tale of 2 Snorkels & Princess Cave. I’ll our be back for more Alps inspiration. Happy trails! This looks beautiful. Those cows! I can’t believe that some tourists were attempting sections of this in heels! That must have been painful to watch. Again, this looks stunning. Shame about the weather stopping you getting out for any more hikes. Thanks for joining us on #adventurecalling . I hope you can when it opens again tomorrow.